Fr. Aristotle Dy, S.J., President of Xavier School, Fr. Ben Nebres, S.J., Former President of Ateneo de Manila University, Edison Sian, Treasurer of Xavier School, and Toby Floirendo, GK Head of Cebu, traveled to Ticad, Bantayan, Cebu province on March 30 for the groundbreaking rites of the Pope Francis GK Village that will be completed in the next few months. The 45 houses (costing 150,000 pesos each) in the new village will be constructed using funds donated to Xavier School (30 houses) and the ERDA Group (15 houses) for the survivors of Typhoon Yolanda. Xavier School raised the funds through a relief drive that began soon after Typhoon Yolanda hit the Eastern Visayas in November 2013, and donations came in from both local and foreign donors. Net proceeds of the 2014 school fair were also used for this project. The ERDA Group funds came from long-time benefactors of the ERDA Foundation and ERDA Tech Vocational Secondary School, who took the initiative to send funds to ERDA to help the typhoon survivors. Named after Pope Francis, the first Jesuit Pope who has inspired all Catholics to live the faith through concrete acts, the village will be inhabited by typhoon survivors from different parts of Northern Cebu. GK does not only build houses. Volunteers and community organizers screen prospective recipients who are required to provide sweat equity, and the community is organized through formation and livelihood programs. Ticad, which has an existing set of houses built by various donors, will now become a bigger community and potentially the biggest GK site in Cebu Province. 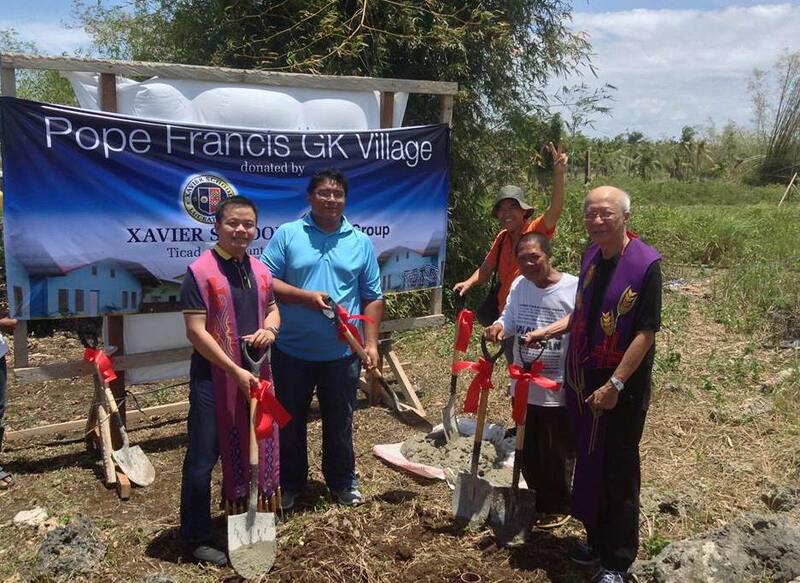 GK Cebu is facilitating the community organizing component of the new Pope Francis GK Village. The groundbreaking ceremony began with Holy Mass celebrated by Fr. Dy in Cebuano, concelebrated by Fr. Ben Nebres, former President of Ateneo de Manila and member of GK's national board. It was he whom Fr. Dy approached to make the donation to GK on behalf of Xavier School and the ERDA Group. After Mass, Frs. Dy and Nebres blessed two houses built by the Singapore American School during their annual house build visit last February. Simple groundbreaking rites for the Pope Francis GK Village followed, capped with a sumptuous seafood lunch provided by the local community. GK volunteers from Cebu City, led by Toby and Yvonne Floirendo, provided logistical support. Fr Manny Uy, S.J., President of Sacred Heart-Ateneo de Cebu provided efficient transportation to make the trip more productive. In June, Xavier School with the help of GK Ateneo de Manila will organize a group of students, alumni, and faculty/staff, to participate in the Bayani Challenge, a 5-day program for volunteers to help build houses in Ticad. 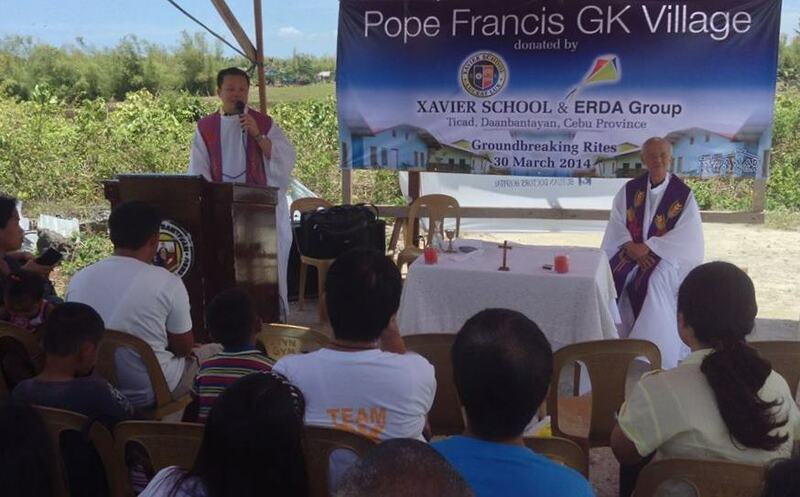 Xavier School and the ERDA Group hope to maintain an ongoing relationship with the residents of Pope Francis GK village. Volunteers and new donors for this project are very welcome. For more details, please contact the School President's office. Like Xavier School and the ERDA Group, you too can be part of Operation Walang Iwanan and help GK in relief, rehabilitation and reconstruction. This coming summer, join 1 MILLION VOLUNTEERS in rebuilding Aklan, Antique, Bohol, Capiz, Cebu, Eastern Samar, Iloilo, Leyte, Negros Occidental, Palawan, Samar, and Zamboanga. Read more details about the Bayani Challenge 2014 HERE.